Special Containment Procedures: All instances of SCP-969 are to be kept in Containment Locker 19-969. All personnel are to be issued information annually on the appearance of SCP-969 instances. Personnel encountering an instance of SCP-969 are to retrieve it through preferably legal means. Description: SCP-969 is a brand of packet insect repellent apparently distributed by █████ Corporation. There are no legal or online records of any █████ Corporation. SCP-969 is typically found on the shelves of various convenience stores mainly in the United States and Canada.1 Instances of SCP-969 will appear on store shelving and records with preset pricing. Store workers show no memory of adding SCP-969 to their inventory. SCP-969's packaging claims that approximately 19% of SCP-969 is composed of an unknown chemical labeled ████. The labeling seems to imply that ████ is the active ingredient of SCP-969. Researchers have isolated all other chemicals in SCP-969 but have been unable to identify ████, lending credence to its role as the active ingredient of SCP-969's effects. Given the anomalous properties of SCP-969, it is suspected that ████ may not be an isomer of its corresponding chemicals in SCP-969, as the packaging claims. Read all directions before using this product. To repel insects, rub on exposed skin areas. Use just enough repellent to cover exposed skin. Do not use under clothing. Do not apply to face or ears. Repeat as needed. Frequent application and saturation is unnecessary for effectiveness. Avoid overexposure. Wipe hands after use. After returning indoors, wash treated skin with soap and water. Avoid contact with plastics, acetate, spandex, and rayon. Use of SCP-969 in the recommended manner results in no anomalous effects, although researchers note a greater efficacy of use of SCP-969 over other brands. Use of SCP-969 in a manner not recommended by the packaging results in several anomalous effects. SCP-969 applied to any plastic overcoat Overcoat began contracting. Subject was unable to escape overcoat. Death of subject. Overcoat remained contracted. Following repeated use of SCP-969, several federal vehicles were seen approaching Site-██. Security forces were deployed and all federal agents were successfully captured. When interviewed, the agents claimed that they had received orders to arrest several substance abusers at the Site-██ location. So far the source of the orders has not been identified. Agents were administered a Class-A amnestic and returned to ███ Headquarters. 1. Instances of SCP-969 have also been discovered in the United Kingdom, South Africa, and Australia, however their frequency of appearance is relatively minor. 2. 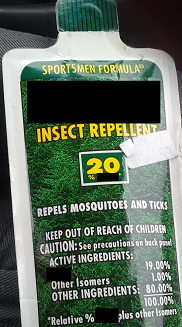 While there are laws surrounding the use of insect repellents, there are no laws regarding █████ Corporation or ████.